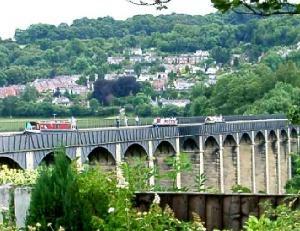 Borrows Rest, is a bungalow, the name having derived from the author of the book Wild Wales, written by George Borrow. 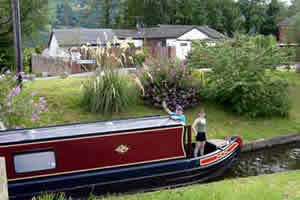 Situated directly on the canalside, the River Dee, Offa's Dyke path and close to Trevor Wharf. It's a haven for all walks of life, especially for hikers, fishermen, cyclists and canoeists and artists. Not exactly the appearance of a pretty Welsh Cottage, but I believe I could guarantee you that you will be pleased with the recently refurbished accommodation, the outstanding view of the valley and especially that of the phenomenal Thomas Telford Aqueduct from the conservatory , pleasant garden surroundings, ample off road parking and hospitality you will receive. I can accommodate up to 6 people. All bedrooms have a kettle, toaster, tea and coffee making facilities. A fridge, Iron, hairdryer and shower robes are available. All rooms are on the ground floor. Some with access directly on to the patio. (weather permitting you can have your breakfast outside). Ideally positioned for touring North Wales. Llangollen 5mins. Wrexham 10mins Chester 25mins, Shrewsbury 40mins. Double bed with door leading to patio with garden table and chairs. Bedrooms 1 and 2 are ideal for four people travelling together as they have a shared shower/toilet, with the advantage of a small kitchen with ample cutlery and crockery and a microwave - so you don't always have to eat out!! Double bed with a private shower room. Special Winter rates available. ie pay for two get third free.